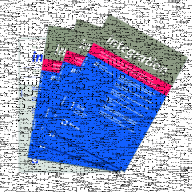 The academic quarterly integration addresses professionals dealing with issues of European integration in politics, administration, academics, education and media. It is a theory-laden interdisciplinary forum that deals with the political dimension of fundamental contemporary issues in European integration from a practical and academic perspective. integration is funded by the German Federal Foreign Office. Two articles of the new issue of integration deal with the implementation of the Lisbon Treaty. 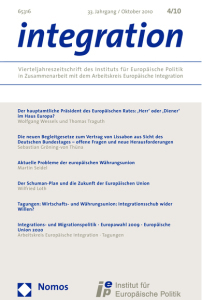 One article examines the new role of the President of the European Council, while the other discusses the increased competences of the German parliament in EU-policy. Other topics discussed are the current problems within the Eurozone and lessons that can be drawn from the Schuman Declaration for the EU’s future. Furthermore the IEP and the AEI report from four conferences dealing with different topics. Directly order integration at Nomos Verlagsgesellschaft or in your local bookstore.